Steve P. Young, the founder of AppMasters.com, talks about how to get app downloads, and how to promote an app for free. App Masters helps clients get featured by Apple, increase downloads using App Store Optimization and drive cost effective app marketing campaigns. AppFollow Mobile Growth Meetup, January 2018. 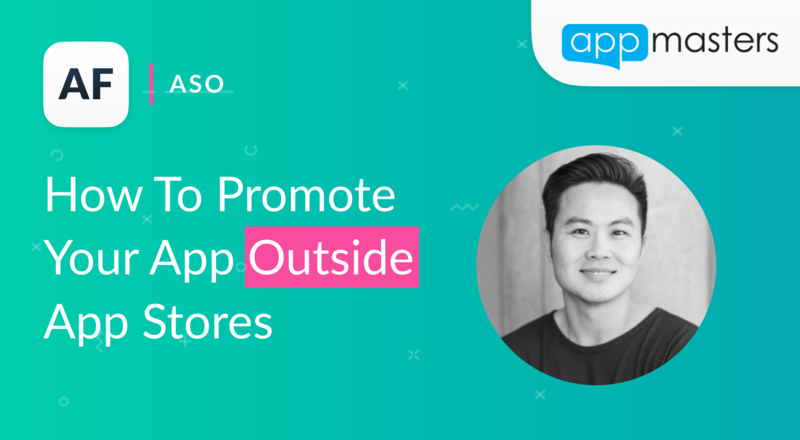 We’ve got some of the PR, so we’re going to talk a little bit more about how do you promote an app, get downloads without actually being in the App Stores, outside of the App Store. PR: How to promote an app, get more downloads without actually being in the App Stores, outside the App Store. Growth hack: how to actually get PR on major publications. The greatest growth hack of all time is how you drive tens of thousands of downloads without spending a dime. Other marketing campaigns: creative marketing campaigns that not a lot of people are talking about; everybody knows Facebook ads, and Search ads. I want to talk about unique influence of marketing campaigns, Reddit campaigns and how you leverage that. Here’s my favorite trick for PR on how you get into major publications. It is finding a reporter at a big publication that just started working there. Choose a company or a publisher that is talking about your category. A lot of reporters have bio profiles on their publication that talks what they like to write about. Certain publishers are talking about technology, some of them health, some might be talking about shared economy, but you want to find the one that matches. 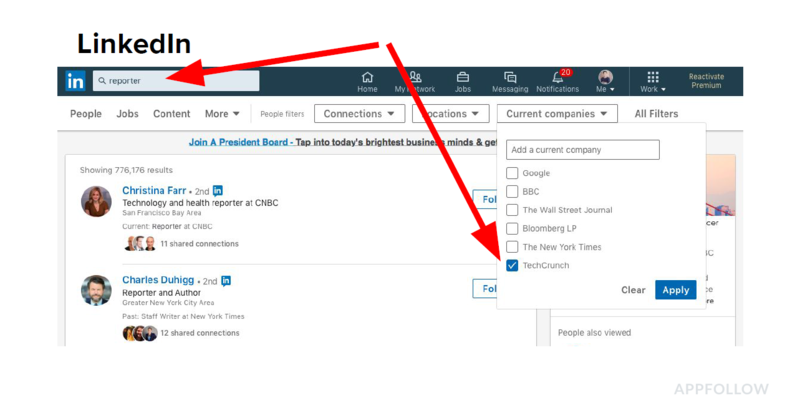 I’m using LinkedIn putting the reporter name, job title, or sort by the company. Here I’ve sorted through TechCrunch. On the top company’s page there are well-known TechCrunch writers, and not everybody's going after the ones that had just started working there. That's how I've been able to get onto the TechCrunch. Once you find the person, it's easy to find their email address, it’s usually on techcrunch.com or their Twitter profile. If you want to catch their interest — give them the exclusive. So here's the exact email that I sent on behalf of a client, what you want to do in the key is say, Megan Exclusive. I found Megan, she just started working there. She was a good fit for who I wanted to pitch and I put exclusive. What means to Megan, and reporters love this, is that they’re the first ones to write it. I write a pretty short email, what I try to do is keep it really bullet point, try to make it schemeable — I don't have long paragraphs at all. I have a video, I talk about the website and then I pitch her. This is an old sales trick, but I sort of made it modern to the emoji era. A-thumbs up, B-thumbs down, C-thinking about it and D-poop emoji. I'm trying to add humor and personality to this email, and make it easy for Megan to respond. All she has to say is A, B, C, or D. Guess what? She chose C, we could get on a call next week. We got on a call, and we're on TechCrunch! And I didn't have to do this for my next client, this was my first interaction with Megan and I just emailed Megan again. Once you have that connection, you're ready to go. Here is the greatest growth hack of all time, I call it a free promotion. That means is you give away something within the app that is normally paid. You make it free for a couple of days and then you get pressed for it. I've done it with other clients to make – still think it's easy. It drives tens of thousands of downloads, it is the best performing from the downloads perspective for driving downloads than any other campaign. You won't get a better CPI because frankly you're not paying a dime to do this. Paid apps, obviously, if you’ve got paid app and you make it free, that's the traditional route — you're making it free for a couple of days. In-app purchases, must be non consumable ones. You can buy this once and get it forever: virtual goods, virtual characters, especially for these Clash of Clans type of games where you have to give away certain things, and then get subscriptions. With subscriptions, unfortunately, you can no longer do a trial, you have to do something that just gives away premium content for free for X amount of days. If you've got a meditation app, a fitness app, you’ve got to make your premium content free for a week or a month. I've done it up to a month or two, about a couple of days is the minimum, but if you want to go up to a week is even better. Anytime you run it with subscription based apps you're getting more subscribers, increasing keyword rankings. Now, you need to get press, the big sites that covers this campaign is going to be AppAdvice. You can have promo codes, put this promo code into AppAdvice in the app section, or in the profile section, and you'll unlock premium content for free for a week. That's it, no trial. The key is no trial. Here's what happened: in the example below is one of my apps that I ran this on. We got close to 18,000, in a nutshell it's the first two days that are going to be the most beneficial we got over 30,000 downloads from running this campaign through AppAdvice alone. It works only coupled with extra promo. By telling AppAdvice we got 30,000, by not telling a single soul, I got 300. You need to get press for this campaign. 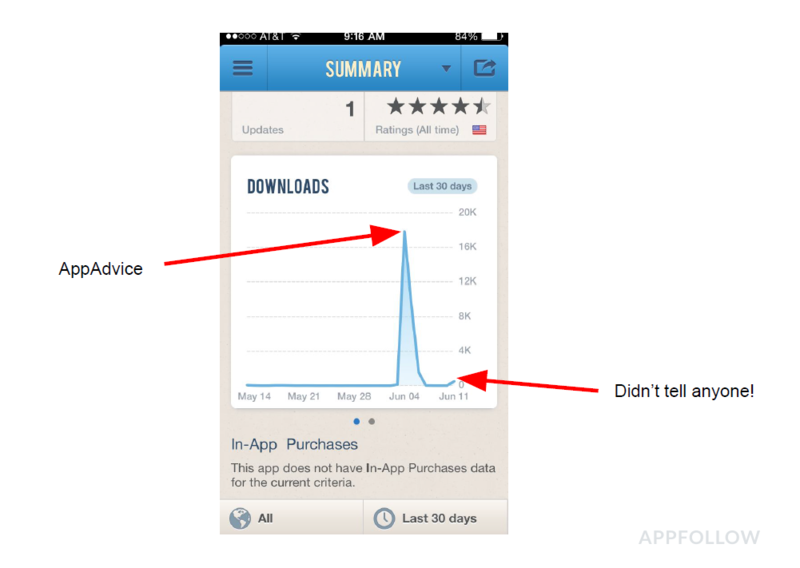 An AppAdvice is the big one I've seen, that is the biggest one in terms of driving downloads because most of those downloads are coming through an app that they have called Apps Gone Free. I've got another client who had a $12 App. He still runs his campaign after me, but we made it free for a day. One day only drove 40,000 downloads. What happened next is because we drove them that much, the day when we went back to paid, we hacked the top charts for paid apps and we made an extra cool thousand dollars the very next day. We got the 30,000 in and then we got an additional thousand dollars the very next day. Just one day. There comes cross promotion. Users download one of my apps that gets 30,000, the rest of my portfolio gets more downloads because people are checking out my other apps. It's a great cross promotion activity. I run this campaign if I've got a brand new app launching. I run it with some of my older apps just to drive awareness for my new app. It increases sales, you're going to get more subscribers. These are some of the channels that I've been actually focused on because everybody understands Facebook ads, the ad networks, Instagram marketing. The ones here are ones that I feel like not enough people are talking about. Influencer marketing can get pretty costly. Here's a website that I love to use — Shoutcart.com. What they do is a sort of Google for influencers where you can search different topics: pets, fitness, meditation, wellness, and find the right influencer. They have a score for an influencer in terms of engagement. It's really cheap, you can get a few for under $100. I ran a couple of different campaigns with different influencers with $100 campaigns. Then you can give them the creative: share this video, or this image, make sure you put it in the link into the bio, and so on. You can do all that within Shoutcart and you can just click buy and then work with them. Make sure you plan ahead because sometimes these influencers take out a lot of time: they're too busy posting pictures; they take a lot of time getting back to you, etc. What you want to do is make sure your tracking is ready to go. I used Bitly link that wasn't tracking properly. So make sure you have the right tracking in place before you run it. I saw clicks on Bitly link, but had no idea how many downloads it drove, so weren't using any of the attribution tools out there. I was trying to use the App Store Connect attribution tools and it just didn't work out well. That was my mistake. I learned the hard way, so don't learn from my mistakes. Next thing that I'm very fascinated on is Reddit marketing. Reddit has ads, and I've heard from other developers who have done phenomenally well with Reddit ads, so take a look at that. Go on Reddit, run some ads, run some test especially because you can then target between subreddits. Speaking of subreddits, this is a site called Social Elves, what they do is they will guarantee that you pick the right subreddit, they'll get your post up to the very top. Everybody understands Facebook, but it's getting really costly in there and really competitive. I like finding these different channels that are going to be less costly than the obvious ones. When compared Reddit to Facebook, $100 running a campaign on a subreddit, we saw really decent CPIs under fifty cent. It wasn't as big as AppAdvice when I was running these types of campaigns, but I also saw pretty decent in terms of just spending $100 and getting 400, 500, 1000 downloads through there. If you find the right channel, the right subreddit, then you can do phenomenally well and even to the thousands and hundreds of thousands. If you’ve got any questions for Steve, you can reach out to him on twitter.